Midnight Update: The final daily rainfall for San Juan is 9.23", the second highest for any day on record. The year-to-date rainfall total is now 185% of normal and only about 8" below the normal for the entire year. If San Juan were to tie the record low rainfall for each of the remaining 5 months in the year, it would still finish 2013 less than 1" below normal. 5 PM Update: It's baaack! With 0.67" more in this hour, the total of 9.11" is now the second highest for any day in San Juan history and a little more than half an inch from the top spot. Moderate rain continues. 4 PM Update: Rain ended with only 0.02" in the past hour, but less than half an inch in the rest of the day would make second place on San Juan's all-time daily record list. The NWS reports that more is on the way. The monthly total of 11.64" also breaks the old July record of 11.08" just 2 years ago. 3 PM Update: Another 1.91" in the past hour brings the San Juan daily rainfall total to 8.42", which is the second highest for any summer day and the 4th highest of all time. 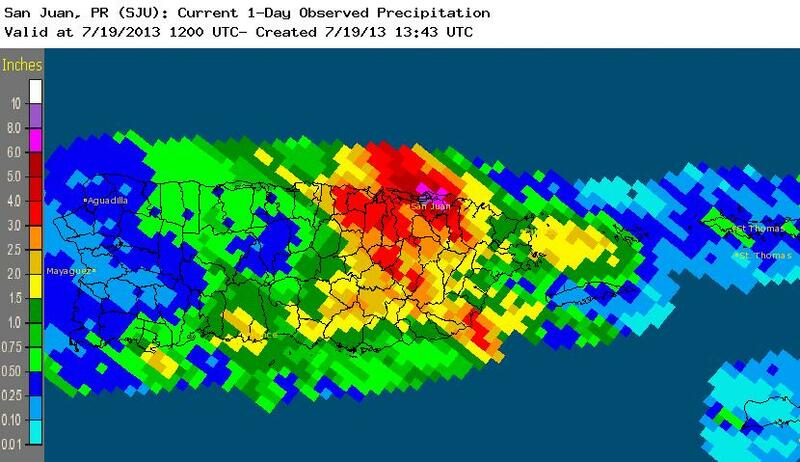 Puerto Rico should get a lot of heavy downpours in the summer with tropical cyclones, right? Well, with no organized tropical system whatever, San Juan has just smashed its all-time July daily rainfall record. The National Weather Service reports that the 4.92" so far today has exceeded by a wide margin the old record for July 18 of 3.19", set in 1950. As of that report, heavy rain was still falling. Today's amount is also well above the old daily record for July of 4.04" on July 7, 1901. It's only the 5th time July daily precipitation has exceeded 3" in a climate history which began in 1898. - The high temperature at Millinocket of 94° tied the record for the date set in 1952. - The 94° also at Caribou broke the record of 93° set in 1952 and tied in 1968. It was also the hottest day there since July 20, 1991. Caribou climate records began in 1939. - The CBC reports that St. John's, Newfoundland had its second hottest temperature for any day since records began there in 1942. The 31.2°C (88°F) high was only slightly below the all-time record of 31.5°C on July 6, 1983. Caribou also broke a record the previous day with 91°, which beat the 90° in 1943.